At 16-km/h (10-mph) working speeds, the 2330 Mulch Finisher can cover up to 27.5 ha (68 acres) per hour enabling producers to size their implements for their unique productivity and agronomic needs. The 2330 is available in sizes ranging from 6.6 to 17.2 m (21 ft, 9 in. to 56 ft, 3 in.). Horsepower requirements range from 24.5 to 34.2 kW/m (10 to 14 hp-ft), depending on the soil, depth, and speed. NOTE: Specification and design subject to change without notice. The Level-Lift hitch ensures a level operation through all operating depths. It also provides consistent gang and sweep depth fore to aft for thorough seedbed preparation. This quick, easy adjustment ensures a flat seedbed floor and level soil profile for planting. The combination of the disk gang, sweep, and harrow functions promotes consistent and uniform chemical placement and mixing. 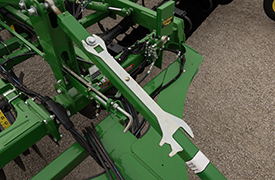 The T-hitch enables easy turnbuckle adjustment for fast tractor changeover and quick implement leveling fore to aft. The heavy-duty T-hitch allows for tighter turning, decreasing the amount of headlands required for quick turns on the end. The T-hitch also houses the hoses and wiring harness, protecting them from crop and incidental tire contact. 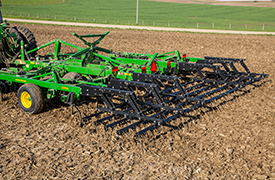 Engaged disk gangs add to the stability of the implement at higher ground speeds for consistent working depth in uneven ground. Thanks to an updated frame design that enables true 229-mm (9-in.) 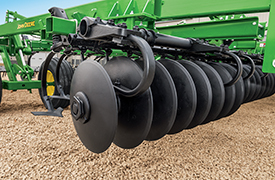 split-the-middle shank spacing, the 2330 Mulch Finishers can maintain consistent depth and evenly cover the field to achieve an optimal seedbed while flowing residue and managing weeds. Even at high speeds and in tough field conditions, the TruPosition C-shanks with 91 kg (200 lb) of trip force minimize side-to-side movement and provide the operator better control of the soil profile for improved leveling capabilities. These shanks provide a full tillage cut across the entire width of the implement. The shanks stay firmly planted in tough soils without quickly relieving. As a result, the soil is mixed completely and streaks are reduced. 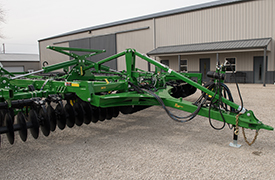 This helps producers maximize their productivity and create flat seedbeds for smooth planter operation and consistent seed depth. The even 229-mm (9-in.) 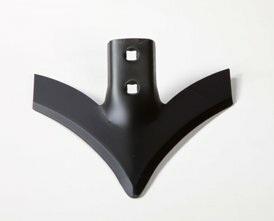 split-the-middle shank spacing enables the 2330 Mulch Finisher to minimize the potential of remaining strips of weeds that survive the tillage pass. With a mulch finisher pass just prior to planting/seeding, the crop can emerge into a weed-free field that gives it the best chance to reach canopy ahead of the weeds. If some weeds emerge and a post-emergence herbicide is needed, weeds should be smaller and easier to control. As a result, the mulch finisher pass helps keep weed management costs under control and helps preserve crop yield potential. Producers are working ground at faster speeds and in tighter soil conditions, requiring more from standards and frames. These standards provide 91 kg (200 lb) of trip force and enable producers to maintain a consistent sweep depth. 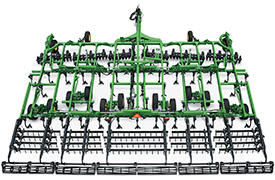 A combination of spring pressure and pivot casting geometry minimizes side-to-side movement and provides the ultimate in soil profile and seedbed. Bolt-on and knock-on sweep options are available to customize the 2330 Mulch Finisher to perform well in a variety of field conditions. John Deere’s high-productivity sweep options are recommended for the high-working-speed market, and perform best at speeds of 11-16 km/h (7-10 mph). 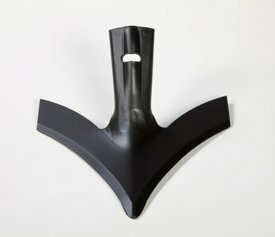 With a low profile and curved wing shape, the high-productivity sweeps provide low draft and consistent penetration while easily getting through tough and heavy residue. Compared to Tru-Width sweeps, high-productivity sweeps are designed to exert less draft and retain their shape for longer wear life so producers can stay productive in the field longer. The high-productivity sweeps for the John Deere 2330 Mulch Finisher come in a 254-mm (10-in.) width, both in the bolt-on and the knock-on Perma-Loc version. They fit all 47-degree standards with 44-mm (1.75-in.) hole spacing and 11 mm (0.4375 in.) that currently take Tru-Width sweeps, both John Deere and other makes. 254-mm (10-in.) Tru-Width sweeps are optional on mulch finishers with 229-mm (9-in.) shank spacing. Perma-Loc utilizes a self-tightening ratcheting system for easy installation. Indentations formed in the sweep stem provide the spring clip with a locking surface. The adapter edge, sweep, and spring all act together to tightly lock the sweep to the shank. The operator simply pushes the sweep on by hand to the first notch (audible click). As the resistance is increased (ground engagement), the sweep progressively wedges tighter. The mounting design minimizes lost sweeps and wear on adapter. Utilizing the removal tool to depress the spring through the stem access opening and a tap with a hammer easily releases the sweep from the adapter and spring. Perma-Loc sweeps have the advantage of using a Tru-Width design for penetration, residue flow, and long life. The proven 47-degree sweep angle minimizes soil slabbing yet promotes soil movement. The narrow stem enhances excellent soil and residue flow. Stem geometry ensures soil flow over the spring access opening, effectively separating and lifting flow to a point higher on the shank. The force of soil flow is reduced on the shank, improving shank life. Tru-Width sweeps with the Perma-Loc adapter can seamlessly move the high-productivity sweeps. The high-productivity sweeps uses the current Perma-Loc adapter for 47-degree curved standard, N237614. Depending on agronomic needs, producers have a choice of six rear harrow options included in the ProFinish Leveling System on the 2330 Mulch Finisher. 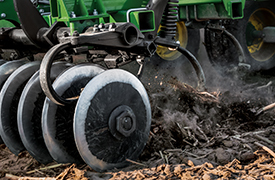 Integrated TruSet Tillage technology enables 2330 Mulch Finisher operators to adjust disk and sweep depth along with down pressure on the active-hydraulic rolling baskets. With a short window of time to perform tillage operations, TruSet can provide significant productivity improvements as operators are able to adjust the mulch finisher while covering acres with the push of a button. By responding to conditions as they change throughout the field, TruSet enables operators to generate better-quality tillage performance with the first pass. 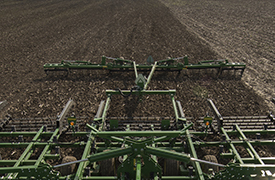 Using a GreenStar™ display, a user sees real-time data for disk and sweep depth, and basket down pressure for assurance of desired tillage outcomes. Once the actual set point is validated and configured to the display in the cab, operators are able to make independent adjustments as small as 2.5 mm (0.1 in.). Four customizable presets enable operators to save and name different combinations of settings for their most common field conditions. Single-point depth control is included with the TruSet Tillage system, giving operators the choice of automated or manual adjustments. Hydraulic routings on the 2330 Mulch Finisher are designed to allow each implement to feature both TruSet and standard single-point depth control for system redundancy, operator preference, and flexibility at resale. 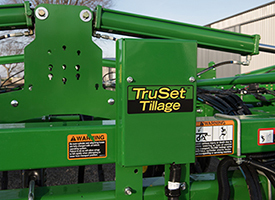 TruSet is compatible with John Deere and competitive tractors. Depending on the tractor, a compatibility kit may be needed in addition to the TruSet Tillage system. The following chart identifies the components needed to operate TruSet on a 2330 Mulch Finisher with a GreenStar-ready tractor. 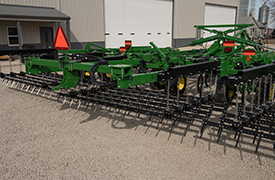 Both the TruSet Tillage system and the compatibility kit will be available as a field-installed option that can be ordered with the mulch finisher or through aftermarket parts. All model years of the 2330 can be retrofitted with TruSet. TruSet requires a GreenStar ready tractor with a supported display. The TruSet Tillage system must have a connection to the tractor ISO connection. With integrated TruSet Tillage technology, 2330 Mulch Finisher operators can incorporate documentation and prescription functionality into their tillage operations. The tillage documentation feature will give producers the ability to capture and analyze the mulch finisher pass for additional coverage of the crop production cycle. Prescription functionality provides producers the capability to ensure their tillage operations are executed correctly, optimizing their investment in preparing for the next crop. Operators can document data for the depth of their mulch finisher disks and sweeps along with rolling basket down pressure. By creating an as-applied map based off of global positioning system (GPS) data for the job performed by each functional area on the implement, TruSet enables producers to document their tillage pass then later review and analyze the data for future agronomic decisions. Additionally, the Prescription Creator by Agrian® company, a connected partner tool through the John Deere Operations Center, enables producers to create prescriptions for each functional area on the 2330 Mulch Finisher. Data from previous yields, soil surveys, or freehand drawing tools can be used to create prescriptions that will command the implement to the desired depth and pressure settings for optimum agronomic results. Agrian is a trademark of Agrian, Inc. The rear hitch is fully compatible with all 2330 rear harrow configurations. Product disclaimer: Product features are based on published information at the time of publication. Product features are subject to change without notice. Contact your local John Deere dealer for more information.